Exposed rubble deposits in the south end of Structure Eight. After the torrential rain of yesterday, this has been one of these calm, slightly claustrophobic days at the Ness, where the cloud is low and stationary, the water of the lochs is glistening and flat and the wind, that torturer of those from quieter climates (see below), is virtually absent. It has made for easy digging and lots of visitors, all of whom we are delighted to see, especially as we are keen to share the delights of the Ness with as many people as possible. We do, of course, hope that many will help us financially by putting an entirely voluntary contribution in the many gift boxes around the site. The cost of excavation is high and times are tough for everyone, but all contributions are spent exclusively in furthering the excavation of the site. Professors Alisdair Whittle and Mark Edmonds examine Structure One. Thank you to all of those who have so far felt able to help us in this vital manner. 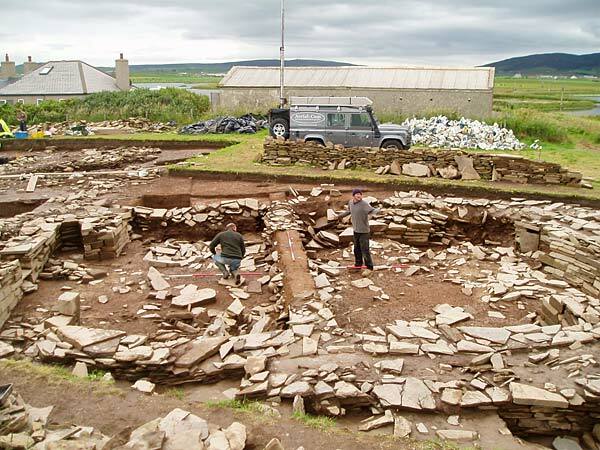 Please also note that we gratefully accept online donations through the Orkney Archaeology Society. These are also interesting times in Structure Fourteen. Hugo, Jim and their team have uncovered what appears to be a drain running across the northern edge of the trench. They are also realising that the structure has suffered repeated episodes of stone robbing over time, often with the scooped areas of removed material filled with simple earth. An exciting find was made today, not far from the drain. A small flake of Arran pitchstone turned up, black and glistening with tiny white crystal embedded in its structure. It is possibly only the sixth example of Arran pitchstone to be found on the site. It is usually found in areas to the north of the island of Arran and not at all to the south. Sharp, but brittle, it is an intriguing find so far from its island of origin. Strange times in and around Structure One. The curving stone wall, which bisects the interior of the building, was assumed to end up against the interior wall of the structure. Excavation yesterday showed that it, in fact, continues through the exterior wall and out the other side. This is an unusual and unexpected development, and one which requires careful thinking before anything sensible can be said about it. Outside the structure, further excavation has shown more walling of a small, ephemeral structure but poking out from underneath it, some very large and more rounded stones. Are these the footing stones of the structure or are they wall stones from an earlier and different building lying underneath? Time, and some hard digging, will tell. Ranging poles are arranged for scale in Structure Twelve for photography. Structure Twelve was cleaned for the second time in two days, thanks to the heavy rain of yesterday. By lunchtime it was spotless and speckless and ready to be subjected to a battery of photographic techniques from every angle. These included elevated cameras, cameras-on-a-pole, cameras on mini-helicopters, cameras on ladders and simple, ground-based, hand-held cameras. Structure Twelve would be forgiven for thinking itself to be a celebrity. 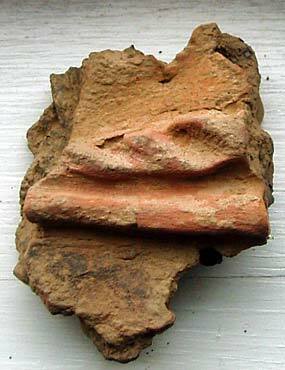 The latest coloured pot sherd. Analytical work carried out on the pottery from Structure Twelve has revealed another piece of coloured, decorated Grooved Ware. This piece has an applied cordon, which has been grooved horizontally with oblique slashes on the lower part of the cordon, perhaps imitating twisted cord or rope. The whole of the applied cordon is coloured red, probably through the use of a haematite (iron ore) wash, which stands in contrast to what is probably a black area to one side and an orangey slip to the other side. It would have been a sensational looking piece of pottery. In Structure Ten, the slots for orthostats have been examined, the dressers are ready to be moved and Sarah has been in a bad mood. Enough said! In the remaining midden-filled southern area of Structure Eight, Dave has removed the upper layer and has come down on to a general rubble spread which may overlay a slate horizon of the sort noted in the north end of the structure. It will be interesting to see if the slate does, indeed, exist over the whole length of the building. An eminent visitor yesterday was Alisdair Whittle from the University of Cardiff. He and site director Nick have been discussing the possibility of including Ness material, including pottery, in a ground-breaking and extensive dating programme. This could lead to a refinement of all Grooved Ware chronologies and settle many pressing questions about the Neolithic that currently vex those working with the pottery, and, indeed, with the whole period. 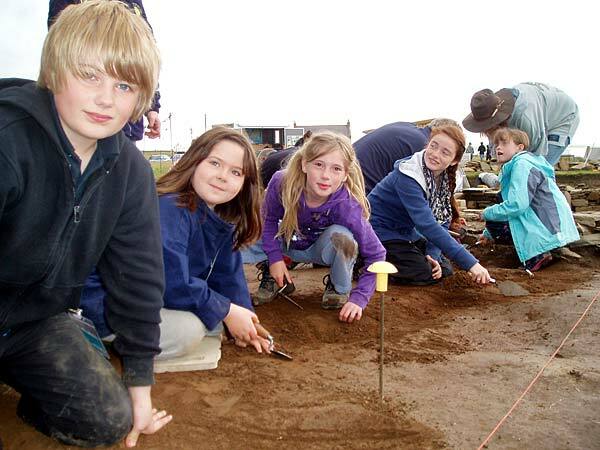 Once again, we were joined today by a bunch of budding young archaeologists for the Excavation Club. This is indeed attracting attendees from far afield as evidenced by a couple from Peebles in southern Scotland, who persuaded their father to drive them up yesterday just for the dig – don’t think they were disappointed. As this diary appears to be stretching into infinity, we will stop now and look forward to tomorrow. Young archaeologists in the making. Hi. 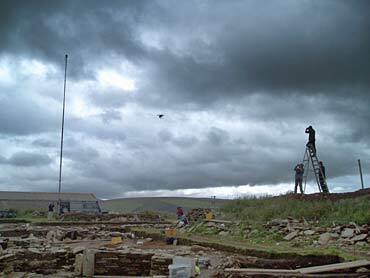 I am a student from Willamette digging here at the Ness of Brodgar. Currently, I am digging in what I believe to be Structure Fourteen. Today, I have just recently uncovered a segment of the wall, along with quite a few stones. Due to all the recent rain we have so recently received, the soil is incredibly soft, making digging both easier and yet more difficult. The work is easier due to the ease of which our trowels can scrape the soil and how readily the dirt gives way. Unfortunately the soil, almost gives way a little too easily, and often I find that I am going a little too fast. For the people working near me who have been tasked with cleaning the soil, life is made more difficult by the rain. To “clean” the soil, one must scrape off a (thin) layer of dirt that has accumulated there since we exposed it. The cleaning process is for photography, and additionally so the supervisors can determine exactly what is in the soil and where we should dig. Where my trowel has struck dirt and rock, is has not found pottery or flint. In fact, I have made only three finds within the last week. 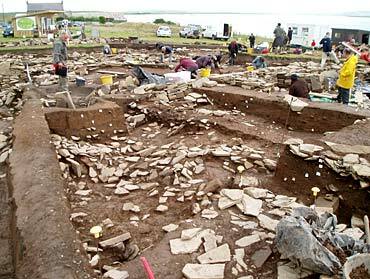 While three finds may sound like a lot, at the Ness of Brodgar, it is a feeble amount to find in a day, let alone a whole week. When I was working in a midden heap, or what could equate to a trash-dumping site, three finds per hour or two was normal, but out in Structure Fourteen the finds are few and far between. Instead of pottery, I find the rock and stone, which I am okay with, because instead of seeing intricate Grooved Ware pottery pieces, I now get to define the walls of a building. It is endlessly fascinating to me to watch as a wall emerges where there was once only dirt, and to think of the biography of that wall. Today was one of the digger’s birthdays, and another member of her group (the Willamette group, in fact) made her an archaeological cake. The cake had multiple layers (seven at last count), and included “finds” such as pieces of butterscotch for flint, Oreos for pottery, and a candy bar which just happened to resemble burnt bone. The cake was shared with anyone who asked, and while some seemed too shy, others, supervisors in particular, seemed excited to try a slice of the delicious cake. Structure Twelve is assaulted by a battery of photographic techniques. Despite it being summer, we are still battling the weather here in Orkney. Yesterday, we were rained out after lunch and today the skies are threatening, with the occasional drop landing on our necks or backs. I must admit to being mildly surprised at the weather. While I am not surprised at the overcast skies, the amount of rain in summer time is, to me, strange. I am assured by residents, however, that compared to winter time this is nothing. And I am entirely inclined to believe them. As I have been digging, the rain has not been the worst of the weather, but rather the wind, which moves loose dirt into cleaned section, but also into eyes. The wind also threatens to move tools around, and rip bags with small finds out of our hands. 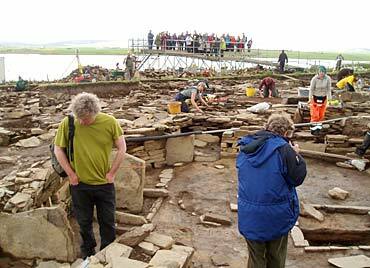 Overall, I would have to say that I have enjoyed my time so far at the Ness of Brodgar. I have already been here for two weeks and I am currently partway through my third week now, with one more to go after this one. Since I have been here I have learned a lot about the artefacts and, more importantly, about their significance. The wealth of finds we come up with each have their own story about how they got to where they are today. What fascinates me is the trend of finds to appear under rocks, which I believe form a protective layer over the artefact, keeping it safe from the ages. With all the artefacts we find, it is intriguing to think about all the ones we do not find, all the material that has melted with the ages and disappeared. While we can no longer do anything for the lost artefacts, we still have plenty to deal with right at our fingertips.